Although Mosaic Making dates back to the Ancient Greeks and Romans it is still a very popular art form and materials used now include recycled materials as well as traditional tiles. 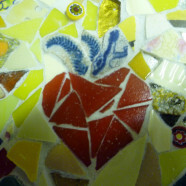 Students learn how to design a piece and the techniques of cutting, composition and grouting. Alex McHallam, the mosaic tutor, has been working with mosaics for 15 years and is a member of the British Association of Mosaic Makers. She has been teaching a regular class at St John’s for 3 years.